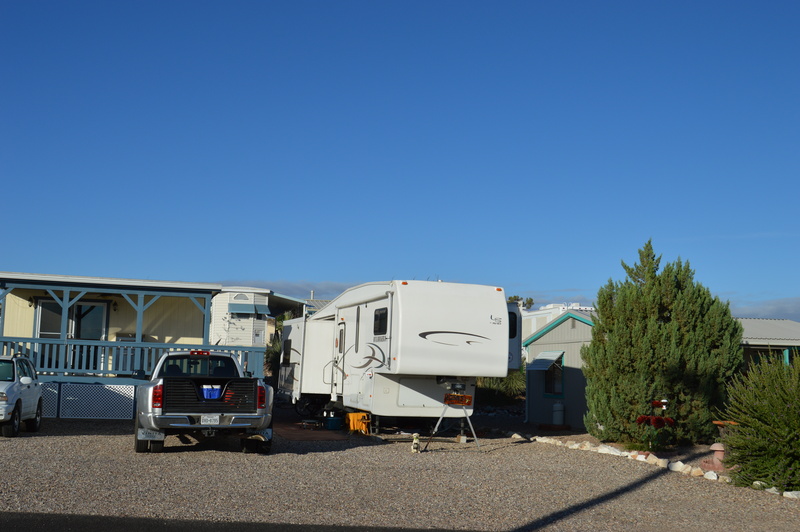 Our stay at Saguaro SKP CO-OP RV Park was enjoyable. We came for a week and stayed for nearly three weeks! We used this time for getting mail delivered twice, catching up on several put-off chores that needed to be dealt with and finally getting our slide working. The weather has been perfect, however, if we had not felt so at home here, we would likely have moved on. We met numerous full-timing experienced RVers who were kind enough to share their experiences. We also met resident leasers of the park who were welcoming and helpful in giving us a tour of the facilities and familiarizing us to the various activities and location of facilities. The RV Park is about 2-3 miles from Benson and seems quite natural and feels remote. We heard coyotes, Javelinas, quail, and met various lizards and from a distance a rattlesnake. The night sky comes alive with stars if the moon is a sliver. The lots are leases and most have a casita although each is different (but do hold to an approved architectural standard). The park is beautifully landscaped by volunteer lease holders. We enjoyed various activities which kept us busy nearly every day. We felt that we met folks who will be our friends for a long time. We participated in the daily happy hour, Monday dinners, Saturday breakfasts, Tuesday Bingo (we don’t do it any better than we did the slots in Laughlin), and the dances, concerts and parties. We toured the surrounding area including Tucson’s Celtic Festival. The Sonora Desert Museum and visiting with family, the Chiricahua and Cochise Strongholds, and a brief drive through Tombstone, Bisbee and Sierra Vista. Yes, we like it here and plan to return. I love getting these updates and the photos are stunning! Miss ya but we’re in better contact now! Hi Jill, Thanks for reading our blogs! We do seem to be able to keep up with one another’s activities with the digital tools available these days. I do miss the exchange of conversation over lunch or dinner, but we are enjoying our adventures. I have never dreamed it would be this interesting and exciting! I appreciate the feedback, it is a pleasure to share and grow.